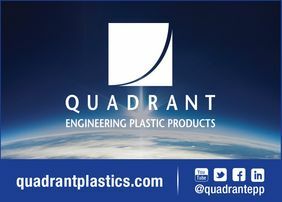 Quadrant Engineering Plastic Products (EPP), leading global manufacturer of high-performance thermoplastic materials, announces management changes in preparation for the retirement of Glen Steady, President and Chief Executive Officer of Quadrant EPP USA, Inc. Effective August 1, 2017, Bernie Willms will take over as President of Quadrant EPP Americas. Michael Koch will also join the Quadrant team in August, in the role of Global COO. Steady has spent more than 42 years in the Chemicals & Plastics Industry, with the last 20 years in the role of Global Leadership. “I have the great fortune of having in place a solid team of highly experienced, long tenured industry specialists fully prepared to lead the company to far greater places as I now stand aside,” said Steady. Incoming Quadrant President Willms has been with the company for 27 years, serving in a variety of management positions within the finance, operations, and commercial arenas. Willms will serve in this new role in addition to his current responsibilities as Commercial Director for the Americas region. Koch, who was an integral part of the Quadrant global leadership team for several years before joining DSM to lead their Engineering Plastics Business Units in Europe and Asia, is an experienced and proven industry leader. Steady will transition all operational responsibilities globally to Koch, the new Quadrant Global COO. Through offices around the world and a continually growing team of over 2,000 team members, Quadrant will continue to push boundaries and develop high-performance engineering plastics solutions under this new leadership structure.